Preceded in 2017 by the performance for camera, Stones across the Ocean: Northern Hemisphere (part 1) (digital vídeo 10 mins looped), This voice cuts me off, removing my feet from their place (2018) is the second work realised by Rubiane Maia in the UK. It is consciously minimal in its presentation of the mulitiplicious dislocations and familiiarities that script one’s personal relationships, movements and spaces taken up in the world. Drafted intermittently between September and October 2018, much like its live counterpart, the following presents a conversation between Maia and myself around the ideas, development, choices and disclosure of the work, observing and sharing how it felt as a durational act, and how it sounded in translation. We would like to give our heartfelt thanks to Manuel Vason and his support during our exchanges. 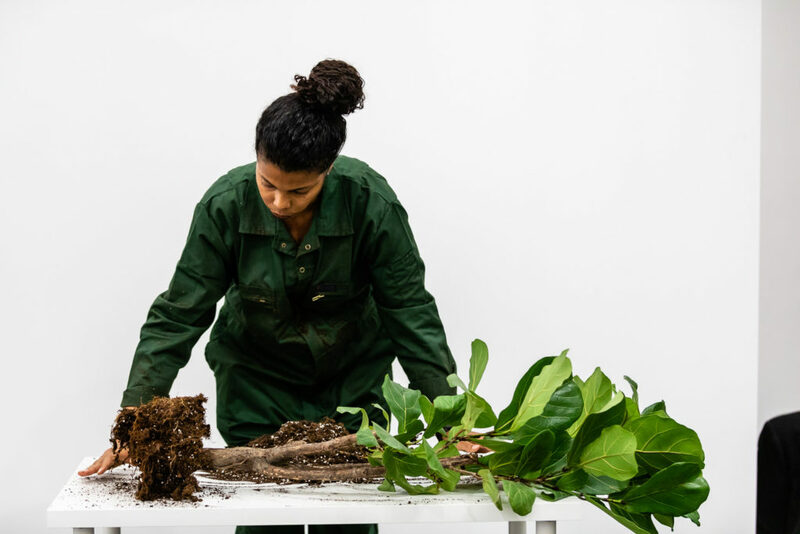 At an early stage in the development of the work and during our conversations you created a space to incorporate other bodies, a tree, and another human being. Can you perhaps talk about what led you towards deciding upon these features of the work? The first element that was created in this work was the text. I started writing in January this year. After the birth of my son I didn’t have time to devote myself to anything other than motherhood, but I felt a deep need to express other urgencies. So I had to come up with a strategy that would allow me to do so. I then began to use the time he was sleeping to sit in front of the computer and write. I made a promise to myself to write ‘anything’ of any time, be it present, past or future without thinking of telling a linear story. The text ended up loose and fragmented. Soon, I realised that this process was becoming extremely cathartic. For the performance I stitched different fragments of what I had written into a single text with the aim of creating a dialogue with an audience. For the first time I then re-read parts of these texts. At this point it became clear that what interested me was not a desire to affirm a self-identity or a personal diary, but to give space to a pulsating “becoming-voice”, one that was alive and vibrant. The willingness and opportunity to work together with a collaborator who could read the text as part of the action came soon after, so I invited you, Adelaide. For me, this other body in the performance becomes a temporary incarnation of this voice – a kind of spiritual channeling. Also, since I do not speak English very well, it was a perfect solution as it was important that the public could access the text fluently and accurately. 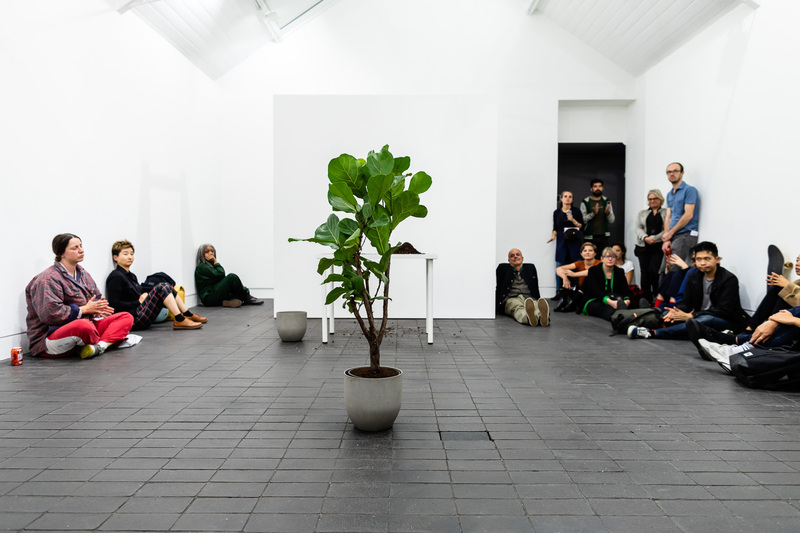 I believe the plant represents the poetic body of the performance. It is the strongest visual and symbolic element. The text speaks substantially about the feet and I wanted to work with roots so as to create a parallel between those two supporting elements. 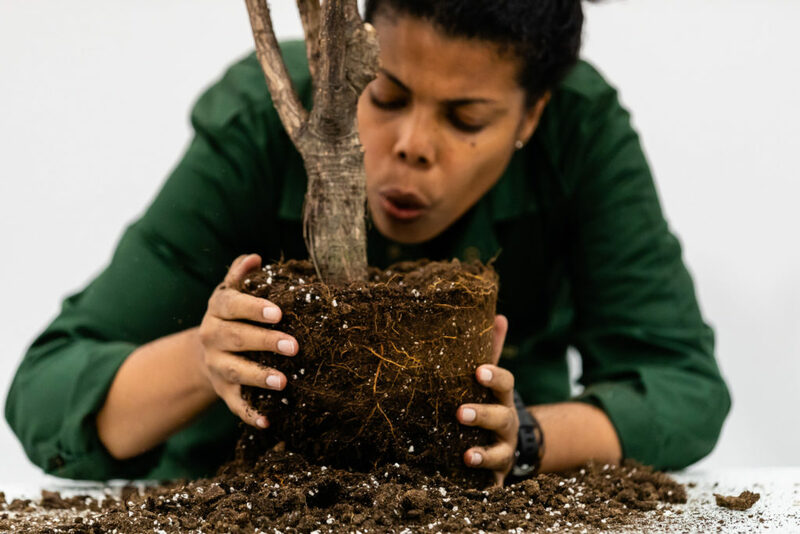 I chose to do the transplantation of the plant in an unusual way, because I wanted to use the same vase, but replacing the old earth with a new one; a procedure that is inevitably traumatic for the plant. But I tried to do everything very delicately and slowly, because the roots are a very strong part of the plant, but at the same time, extremely fragile. I have a lot of interest in plants, and this is not my first performance with ‘bodies-plants’. I believe that a kind of intuitive and silent communication between plants and people is possible. 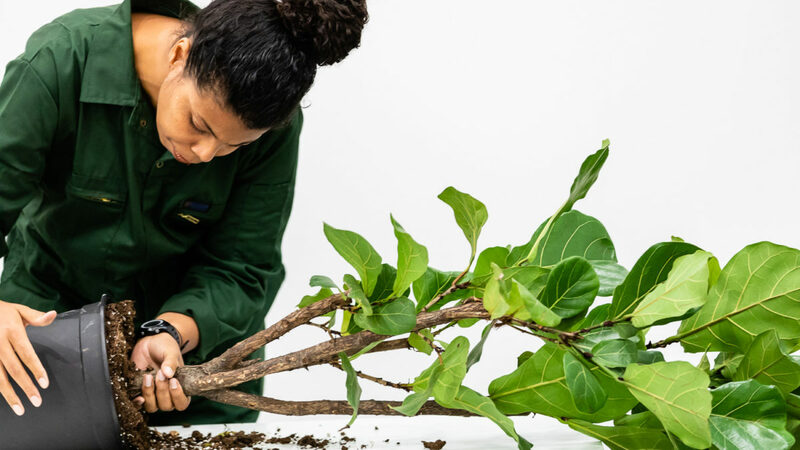 In this case, I chose a Ficus lyrata, a plant native of western Africa, a continent that is part of my history as a black woman descended from African slaves born in a colonised country. So I think ‘we’ somehow share aspects of that ancestral memory. Our shared connectedness to Ficus Lyrata (the tree) became very strong. In fact, I found it amusing that I was over-identifying with her. Your invitation to narrate from the other side of the wall between us was very welcome in that it enabled me to draw psychically from a small ensemble of thoughts, personal therapeutic actions, and texts, specifically Audre Lorde, Sister Outsider in particular ‘The Transformation of Silence into Language and Action’, Mlanden Dolar’s, A Voice and Nothing More, the chapter ‘The “Physics” of the Voice’(I’m forever enamored with his re-telling of Pythagoras’ pedagogical methodology to teach from behind a curtain so that his students would attend to listening to his voice and words), and Through Vegetal Being, co-authored by Luce Irigary and Michael Marder, which I found to be very healing during a bout of depression. These texts have become companions. They came together in my sensing of your action. Reading your translated text fully was bewildering in the sense of how it held together and alternated between perspective and persons being addressed. The pace of my cognition in understanding how to read each sentence and paragraph shifted constantly between certainties, doubts and revelations. To read it was challenging for my voice and relatedness to each scenario. Being amplified I did wonder, what could be heard? How faithfully did the translation to English represent the nuances of your text? It was nice for me to hear your voice and feel your physical presence on the other side of the wall. 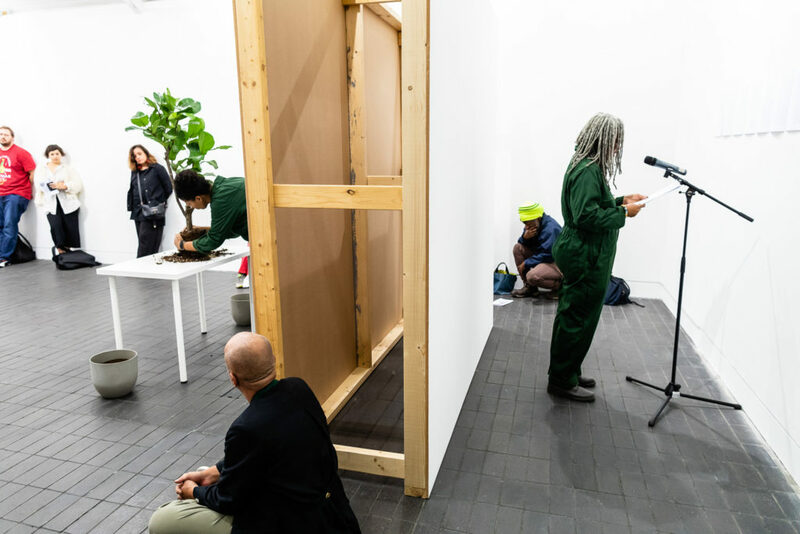 We must remember that the wall in the performance also represented a significant element of the piece – connecting bodies, however separated by different perspectives. 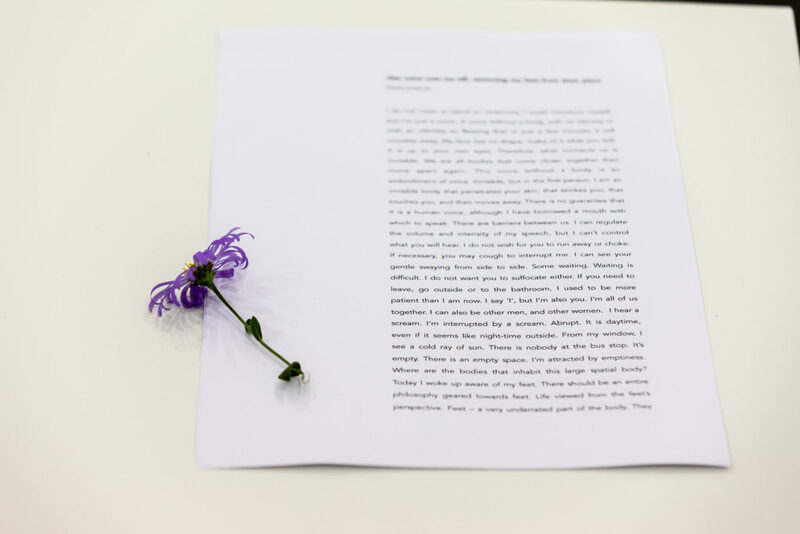 I think the issue of the translation has to do with exactly this: a playful game of proximity and distance between the two of us; between us and the plant; between your voice and the audience. I think it is essential to make visible the trace of my being as a foreigner who comes from a Latin American country. Inevitably this is a performance charged of many questions about language, but I believe that the strength of the work stands on the aperture toward other modes of understanding and different forms of listening. At the same time it gave me the opportunity of appropriating my right to speak. The text is purposely fragmented, has many layers and it is really difficult to absorb it from beginning to end, but I was surprised by the silence and the level of attention paid by the audience. The action created a meditative and contemplative atmosphere that encouraged each one to perform a dive into an inner connection. I identify myself a lot with the idea you suggested: that certain texts and books have accompanied you or are still guiding you during your life. I feel it constantly. They are part of the voices that help us denunciate, reveal, and question inspiring poetry, and so much more. This year I managed to read only two books: ‘M Train‘ by Patti Smith and ‘Dear Ijeawele, or A Feminist Manifesto in Fifteen Suggestions’ by Chimamanda Ngozi Adichie. They are both great for the sincerity and simplicity with which they deal with complex issues. I felt that ‘M Train’ influenced me a lot because I recognised myself in this person who leaves the house almost every day to sit at the same cafe, in the same table with the purpose of writing for many years, over and over. There is this subtle quality in revealing intimacy in so many things greater than us as human beings. Writing has been a strategy of personal therapy that I have encountered accidentally, as the daily exercise of writing has given me the perfect instrument to shake up very deep psychic aspects, enabling an intense updating of the perceptions that I have about my memories, especially those that mark a sense of identity. I am confronted with the countless narratives that my personal, family, professional, social, ancestral history are made of. Reviewing events, traumas, abuses, injustices, mainly caused by racial and gender issues, has been an arduous and exhausting process, sometimes emotionally unbearable, but of extreme urgency. “Each of us is here now because in one way or another we share a committment to language and to the power of language, and to the reclaiming of that language which has been made to work against us. In the transformation of silence into language and action, it is vitally necessary for each one of us to establish or examine her function in that transformation and to recognise her role as vital within that transformation”. Writing is challenging. To write, speak, live authentically without censoring is a singular and collective action towards finding ourselves. Your text was deeply entrenched and reflective of the differing circumstances one encounters, and though your text was built over a period of time, it was fascinating that the fervour of it articulated itself almost as a stream of conciousness. I imagined the words guiding your fingers teasing out the roots of Ficus. How is she? This statement is very powerful because it highlights the core of a great conflict: the non-fidelity of language and, at the same time, our implication in the breaking of silence. It’s a difficult commitment to take on because it puts us on the front line of the battles. I have reflected a lot on this idea of ​​breaking the silence, because I realise that we are living in a moment in which this disruption has become a collective urgency. I feel part of this. I feel contaminated by this need to affirm ethical and political issues that have long been invisible. The exercise of speech, writing and action makes it possible to take a position in this place of transformations. We are giving up a neutrality that never really existed, but which has always nourished the maintenance of certain privileges (which benefited only a few). It is a tremendous job to deconstruct the censorship that is embedded in our bodies, our minds, our emotions. The commitment to write every day without having a definite direction has put me in confrontation with some issues: the encounter with unexpected, dirty and perverse facts that interrupt the writing with an alarm. As a consequence, a part of me responded immediately by taking a step back. Unintentionally the filter of politeness, civility and defence emerges by saying: this yes, that not. Writing puts us at risk, and it hurts, but it’s a pain that makes you wake up, and that helps cleansing the wounds. I began to study the ‘Automatic Writing‘ of the surrealists, as well as the ‘Psychography’ of Allan Kardec’s spiritualism. Surrealist poets used this exercise with the intention of entering into a trance capable of subverting the conscious mind that controls and limits what is acceptable to be said or written. In Psychography there is this idea of ​​‘body-passage’: a body that opens to be crossed by a stream of energy. Both concepts interest me, because I’m just looking for strategies to access this crude, ungoverned language. I will continue, it will be a long-term job, but I want to create a kind of ‘performance book’. The idea is that each presentation will give birth to a new chapter. So, This voice cuts me off, removing my feet from their place was the first. Now, I am preparing ‘Chapter II’ with a new performance and a new text that will be presented soon in Brazil. As for Ficus, she’s here, very close, and I can see her as I answer your questions. Ficus is a mysterious plant that I am learning to know. Her appearance has not changed much after a month, although I feel she is not comfortable yet, needing a lot of attention and care. It’s too early to gauge the impact the performance has had on her roots, but she’s still standing with bright green leaves, and is stronger than I could imagine. I’ll tell her that you send her a special and loving hello.